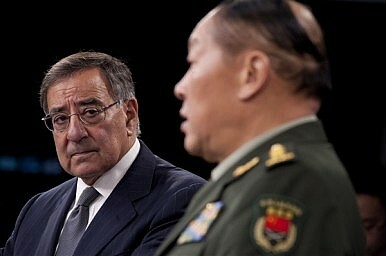 Chinese Gen. Liang Guanglie is in Washington for defense talks. He might actually end up leaving happy. As the Chen Guangcheng saga drags on in Beijing, this week’s visit to Washington of Gen. Liang Guanglie, China’s defense minister, risks being overshadowed – or at least that’s the angle that much of the coverage of Liang’s trip seems to be taking. In fact, Liang is almost certainly more interested in the shadows cast by the round of defense diplomacy that took place in Washington immediately prior to his arrival: the so-called “2+2” summit between the Philippine defense and foreign secretaries and their American counterparts. The visit of Defense Secretary Voltaire Gazmin and Secretary of Foreign Affairs Albert Del Rosario had been scheduled long before last month’s maritime confrontation between Chinese and Philippine ships at the disputed Scarborough Shoal (a dispute that continues to rumble on, with some ominous statements being made at the diplomatic level). But the latest spat certainly gave their mission – to secure more defense support from the U.S. – an added sense of urgency. Their lobbying yielded the following public commitments: an increase in foreign military financing (FMF) for the year to September 2012 to $30 million (up from $15 million); a U.S. pledge to share “real-time information” with Manila to help it monitor its maritime possessions; non-specific assurances that more U.S. excess defense articles will find their way into the Philippines’ inventory; and a promise to nudge Australia, Japan and South Korea into giving the Philippines some of their older kit. None of this should prevent Liang from spending a productive few days in Washington. For one, it’s clear that the U.S. pivot to Asia barely extends to the FMF program. In 2011, East Asia and the Pacific in their entirety garnered less than 1 percent of the total $5.47 billion FMF budget, and the modest boost to the Philippines’ share isn’t about to change that. Of course, FMF is not the only indicator of U.S. military assistance (and the U.S. gives the Philippines extra cash through other schemes), but it’s an important one. Second, the United States appears to accept Chinese sensitivity as a significant constraint on the pivot to Asia, especially with Sino-U.S. relations in so delicate a state. High-profile Chinese people keep fleeing to American consulates and embassies, causing unwanted embarrassment on both sides. The two countries’ brittle military-to-military relations have only just been restored and need time to cement. Now isn’t the time to take sides in a bilateral dispute, and the U.S. has offered assurances that it has no intention of doing so. So, Washington’s strategic actions remain a lot more modest than the headlines might lead you to believe: Marines in Australia (hardly on China’s doorstep) and littoral combat ships (which sound impressive, but are actually relatively small naval vessels) to be based in Singapore. The assistance to the Philippines is part of this pattern of marginal adjustments. Washington is drip-feeding additional support to its regional allies, not opening the taps. The Liang visit ought therefore to be quite cordial. He might even leave Washington later this week feeling more upbeat than the Philippine delegation that preceded him.